It's is officially two months since I started on a no buy, and I'm pleased to say it's going very well! I have managed not to cheat at all. The only beauty purchase I have made was at the Khiel's event. Purchase was allowed because a) special event, b) I needed new cleanser/toner/moisturizer anyways. This no buy has allowed me to appreciate the products I already have. And made me realize my product addiction isn't as bad as I thought. As soon as I started thinking "do you really need this" it was easy. 99% of the time the answer is no. So I have been saving my money (well, sort of, I'm still buying clothes). 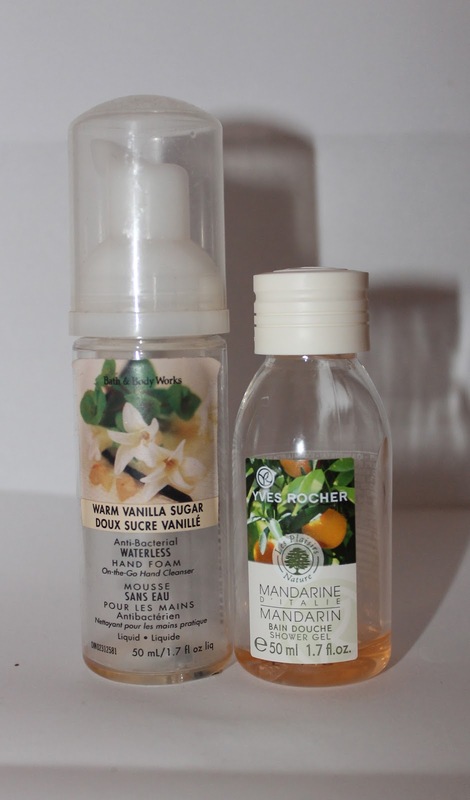 Bath & Body Works Vanilla foam hand sanitizer. I generally try not to use hand sanitizer, but this lived on my desk at the office over cold and flu season. I have had this forever. The proof? This type of sanitizer is discontinued! Yves Roche tangerine shower gel. I got this in a Luxe Box a while ago, it was nothing special. Smelt exactly like Satsuma from the Body Shop. I am pleased to say that after finishing this little bottle, I'm down to only having one shower gel in my shower! No spares! Ralph Lauren Hot perfume. This was the first gift J ever bought me (insert "aww" here). I think this is only the second perfume I have ever finished. It lasted about 3.5 years, as I didn't wear it everyday, and I have 5 other perfumes plus a ton of samples. Perfume sample from Nina Ricci. This was one of the many samples I have received through Luxe Box. It was ok, a little too musky for me, but I wore it to the office to use it up. Bare Minerals volumizing mascara, Tarte amazonia clay mascara and Fairy Drops mascara. These have all previously been seen in my Mascara of the Month posts. The Bare Minerals was my favourite of the three. The Fairy Drops is a little bit of a cheat, as it's not empty. But I tried it, and hated it. Time to let it go. If you're on a no buy, let me know hows it's going! Wow 7 empties in a month? Impressive! I'm impressed. Last time I went on a project 10 pan, it lasted over a year and I eventually gave up because I was still only at about 7 products! Good for you for doing a no buy! I have tried that too but don't seem to be able to stick to it for too long.. so kudos to you! :) these perfumes all look so yummy too!